First off, how would you describe your sound? Rosa: Always a tricky one, I guess like ‘electronic pop’. Jenny: I think it’s quite idiosyncratic. R: Taking influence from lots of different genres and styles. J: I’ve been listening to quite a lot of Japanese Breakfast at the moment. R: I’ve been listening to quite a bit of R&B; Anderson.Paak, Masego. Just bought an old school R&B CD for the van in Tesco the other day. J: Along with a karaoke four CD multi-pack of CDs. So you’ve got a new album coming out, I’m All Ears, which is out on 29th June and you’ve dropped three singles from it so far, ‘Hot Pink’, ‘Falling Into Me’ and ‘It’s Not Just Me’. On your last album I, Gemini, you seemed to talk a lot about growing up in Norwich, what are you drawing from this time? J: I think this album’s kind of more honest and personal, which we’ve said quite a lot, it’s more specifically about our relationships with different people, so our friends and people who we’ve met on tour. Our lives have changed a lot over the last couple of years since we released our last album. So it’s kind of still about Norwich, but also about other places we go to. I also wanted to ask you about the production on this album because you’ve got some really interesting people behind some of the tracks; SOPHIE, Faris Badwan (frontman of The Horrors) and David Wrench, who’s a bit of a veteran, how did this come about? R: Absolute legends. Through our label really. I was really amazing to have influence from those people. J: I mean me and Rosa were quite big SOPHIE fans before we actually worked with her. You can definitely hear the SOPHIE influence on ‘Hot Pink’. J: Yeah, it just felt kinda natural I think, working with David and Faris because we all had such separate skill sets, so together it was great. R: And we all get on really well because they’re really nice people. David Wrench is actually an icon, he’s amazing. J: Yeah he’s magical. The only words that can describe David. You’ve definitely had a shift in sound since your first album, from a more subdued sound to these first two singles which sound more visceral, is that something that’s carried onto the rest of the album? J: I think those two songs are quite bold and out there in terms of the sound but I think that there are some quite vulnerable moments in the record that are paired up with that. I don’t think we were trying to do anything but represent our feelings over time. We weren’t trying to be like “we’re going to create a really loud and intense record”. So you didn’t have something in mind when creating this second album? It was something more natural? R: I think so yeah. There are quite a lot of different moods in the album, like there was in the last one. J: I think with the singles it just made sense to put out those ones because they’re stronger in that way as you were saying. You’ve been making music together since you were 13. How has your music changed since then? R: I definitely couldn’t sing when we started the band, I definitely had to train myself. R: Don’t beat yourself up. I think we’ve definitely developed as songwriters also. J: I think we’re more confident about our opinions as well. R: Yeah and also we’ve got more to write about, we’ve learnt more about music production and how to use technology as a tool as well. Before I guess we were a bit in the dark with that, and that worked in our favour in a different way. Something I really liked about your last album is how varied the instruments were, is that something that carries forward to the new album? R: Yeah we still use lots of instruments. J: I think that we’ve always tried to use, even while going forward, different instruments because they all have different textures and different timbres and stuff. R: As we’ve got more into synthesis, we’ve been able to do that with synthesisers. J: Yeah, rather than necessarily having loads of different instruments. R: But there are still some acoustic sounds throughout the record as well because I think it’s important to balance out. J: I think it can sound dated if you’re not balancing out organic sounds with electronic sounds. Are there any sort of milestones you want to reach as artists? J: It’s hard because our last milestone was playing on Jools Holland but we did that last year, so we haven’t really thought about it. Erm… We’ve always wanted to go to Japan and play there. R: Yeah that would be really awesome. J: Also I’d really like to see people respond to the new album and say they can relate to it more, with people relating their own experiences to the lyrics and stuff. I think that would be really rewarding. I think because the lyrics in the last album were so abstract, it was hard for people to know what the hell we were talking about. I’ve definitely felt more of a resonance with your newer singles. R: Yeah it’s quite hard putting yourself out there like that and being so open in lyrics. Because some of the songs on I, Gemini were ones you wrote when you were younger, right? R: Oh yeah, most of them we wrote when we were 13 or 14. J: I think the thing that has carried across is that we continue to use a lot of imagery in our lyrics. So the first album was very much about visuals but in ‘Falling Into Me’, there’s already a lot of descriptions of images and also in-between the really descriptive lines there are ones that are really direct. Are there any artists in particular that you dream of collaborating with? R: There are so many good people, it’s hard to pick. I don’t know. J: This is hard. What about the puppet man in Norwich? R: Yeah, the puppet man. J: There’s this guy in Norwich who plays music in the street and has puppets and he like waggles them about to the music and collects coins. I’m not sure how he’d be featured. R: If you’re from Norwich you would know, but if you’re not, it’s hard to explain [laughs] Google him! J: I think he went on Britain’s Got Talent actually but I don’t think he got very far. R: Aww man, if we were judging that though, he would have been right up there. So we should expect puppet-based music from now on? R: No, the puppet man would just do the puppet along to the music I think. J: He’s a live show guy to be honest, we’d have him on tour with us, with his puppets. Sounds good! Good luck with your show tonight, even if it is puppetless, and thanks for taking the time to talk to us. 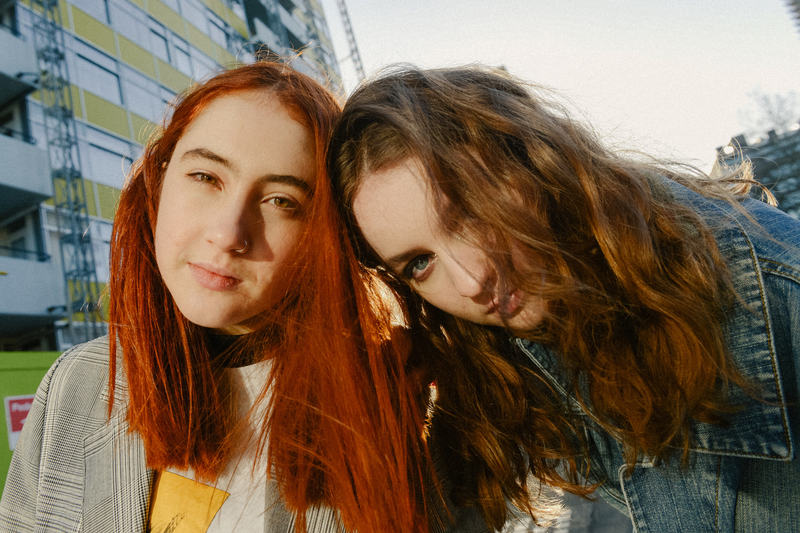 ‘I’m All Ears’, the new album from Let’s Eat Grandma, will be released on 29th June via Transgressive Records.